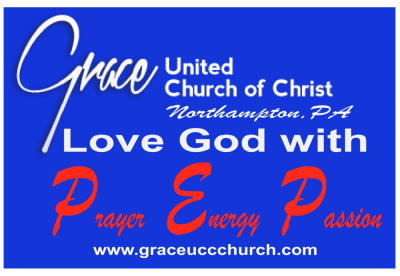 Within a few weeks following the unvailing of the mission statement Grace has “Loved God with PEP” in so many ways! Our church has supplied tickets to 20 families in need, for our annual Spaghetti Dinner through the Northampton School District. The recipients of these meals were very grateful. Our church orchestrated a community effort to purchase 400 Turkeys, Hams and Chickens for the Northampton Food Bank. “Operation gobble gobble oink oink cluck cluck” hopefully has made the holidays a little better for 400 homes. We Pray for our neighborhood. We are Passionate about respecting, including and helping our neighbors and members. We will spend countless Energy to fulfill our Passion. These are a few ways Grace Loves God with PEP just since adopting the new mission statement.